Reflections for Detective William B. Titus, Jr.
We all miss you and cherish your memory. We poured you a pint, laughed and cried. Corey has followed your footsteps and is now in the academy. Rest easy my brother. Keep watch of your loving family from Heaven. May they and all those who will always remember you, are blessed and safe from harm. We, who were there, are still here. Don't know why, but when we are called to go, I know that it will be my honor to meet you. Bill, it's been 13 long years and we all miss you dearly, from that infectious smile and laugh along with the music and movies. It seems like yesterday we spoke. Keep smiling down upon us. 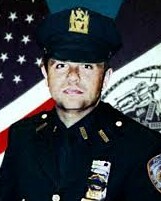 On today, the 13th anniversary of your death I would just like to say thank you for your service and sacrifice for the citizens of New York City and our Country as well. And to your family and loved ones, I wish to extend my deepest sympathy. I said a little prayer today for Detective Titus and his family. He may be gone but never forgotten. He will always be a New York HERO. Your heroism and service is honored today, the 12th anniversary year of your death. Your memory lives and you continue to inspire. Thank you for your service. My cherished son Larry Lasater was a fellow police officer who was murdered in the line of duty on April 24, 2005 while serving as a Pittsburg, CA police officer. I am privileged to be the first to leave a reflection here honor and Thank You Detective Titus for you service to our country.